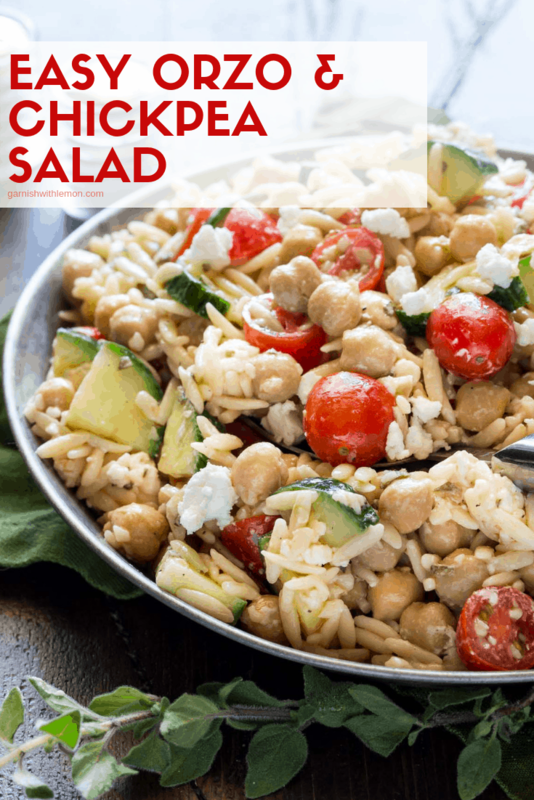 Pack some protein into your summer pasta salads with this Easy Orzo and Chickpea Salad recipe! One of my favorite things about summer (aside from the warm weather, lack of routine and ridiculous amounts of ice cream) is how we eat. Gone are the heavy meat and potatoes meals of winter. Instead, we relish fresh produce and low maintenance meals. 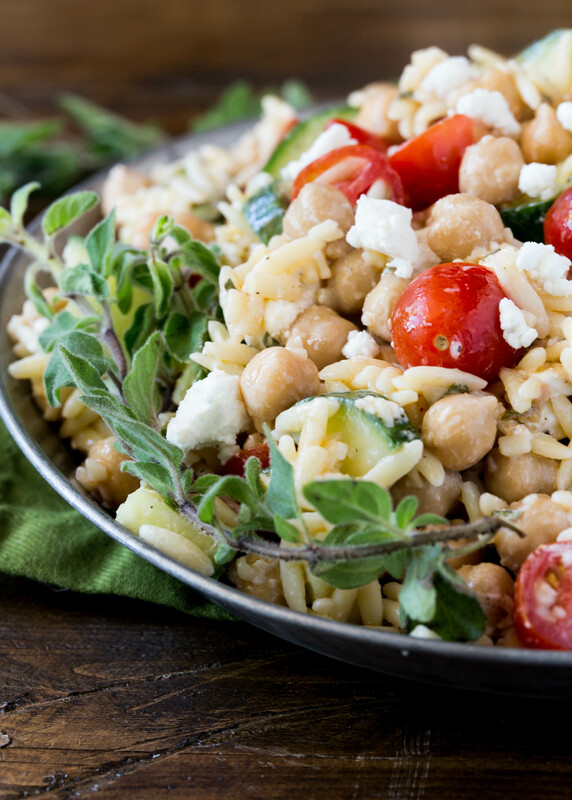 This Easy Orzo and Chickpea Salad is the perfect example. It’s a snap to make in advance for a backyard BBQ plus it doubles as a tasty lunch or snack to pull out of the fridge when the munchies strike. Other pulses family members include dry peas, lentils and beans. Adding pulses to a recipe is not only delicious, it’s also a surefire way to add more nutritious ingredients to your diet. Need further proof? Our Southwest Quinoa Salad – filled with black beans – is one of our most popular recipes! I prefer to serve this Easy Orzo and Chickpea Salad chilled, but it’s also tasty at room temperature, which is great for entertaining. If you do prep the salad ahead of time, hold back a little bit of the oregano vinaigrette and stir it into the salad just before serving. Tip: You can also substitute feta cheese in this recipe with equally delicious results. Sooooo, adding this Easy Orzo and Chickpea Salad to our summer menus means I can feel better about eating ice cream everyday, right? Cook orzo according to package directions. Drain, rinse with cold water and set aside. Combine olive oil, vinegar, oregano, garlic, salt and pepper in a small mason jar. Shake vigorously to combine. 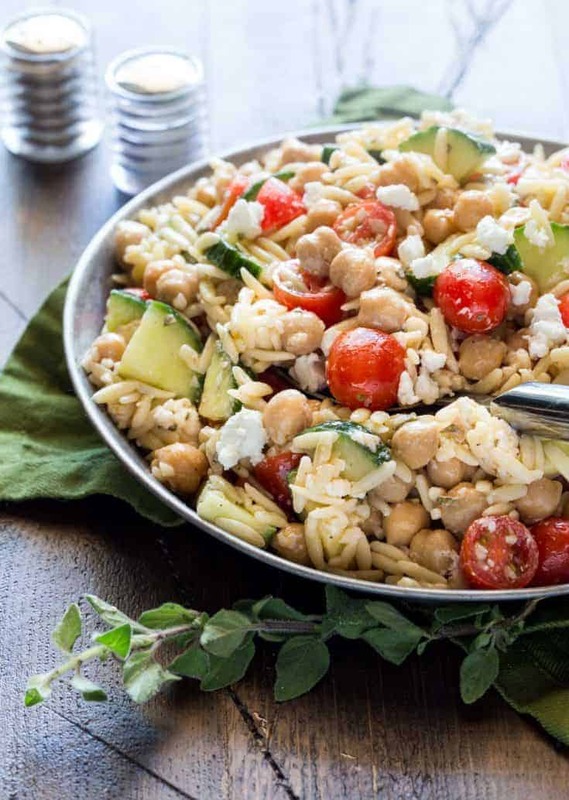 Add cooked orzo, goat cheese, cucumber, tomatoes and chickpeas to a large bowl and stir to combine. Drizzle 2/3 of oregano vinaigrette over orzo mixture and stir to combine. Chill for at least 1 hour. Stir before serving and add remaining vinaigrette if desired. Disclaimer: This post is sponsored by USA Pulses and Pulse Canada. Pulses are the delicious, protein-packed, sustainable foods known as dry peas, chickpeas,lentils and beans. All opinions are our own. Thanks for supporting the organizations that make Garnish with Lemon possible.